Injuries to the medial aspect of the distal humerus in young children can range from an avulsion fracture of the medial epicondyle to a much more serious Salter-Harris type IV fracture of the medial condyle. Medial condyle fractures involve a fracture line that extends through and separates the medial metaphysis and epicondyle from the rest of the humerus; by definition, the fracture line must involve the trochlear articular surface. Medial condyle fractures must be distinguished from medial epicondyle fractures that involve the medial column but are extra-articular; these are separate entities. The distinction between these two types of fractures is key to the selection of appropriate treatment. Both fracture patterns may be difficult to diagnose in young children, especially before the secondary ossification centers have formed. [2, 3, 4, 5, 6, 7, 8, 9, 10, 11, 12, 13, 14] Inadequate reduction of the physeal growth plate and the joint surface cartilage in a medial condyle fracture can lead to serious complications. The age of the patient, the extent of initial injury and displacement, and delay in initial treatment play important roles in the clinical outcome. For medial epicondyle fractures, nonoperative management of fractures displaced up to 15 mm does not appear to be associated with functional deficit unless there is entrapment of the epicondyle fragment in the joint. 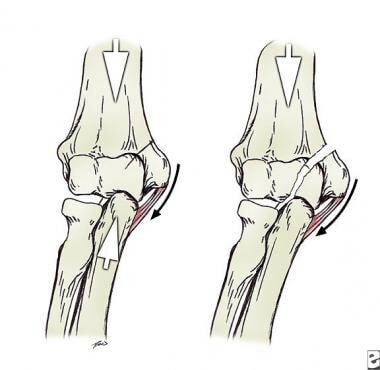 Entrapment of the epicondyle fragment in the joint can block motion, and therefore, the fragment should be reduced. The trochlea is the distal medial articulating end of the humerus, which acts as a pulley for the ulnar trochlear notch to rotate around as the elbow is flexed. The coronoid fossa is the depression on the anterior surface of the medial condyle proximal to the trochlea that accommodates the coronoid process of the ulna. 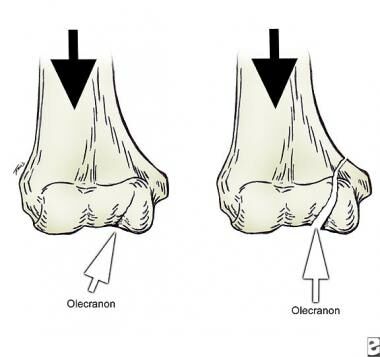 The olecranon fossa is the depression on the posterior surface of the medial condyle proximal to the trochlea, which accommodates the olecranon of the ulna. The medial epicondyle is a prominent palpable process that projects medially from the trochlea and is the point of origin of the pronator teres and the common flexor tendon, which includes the flexor carpi radialis, the palmaris longus, the flexor carpi ulnaris, and the flexor digitorum superficialis. The medial epicondyle is the origin of the medial collateral ligamentous complex (see the image below). The medial supracondyle ridge is a bony ridge that runs proximally on the medial humerus from the medial epicondyle. Attachment of medial collateral ligament components is pictured. The capitellum, a rounded ball of bone adjoining the trochlea laterally, is the distal lateral articulating end of the humerus that articulates with the radial head. 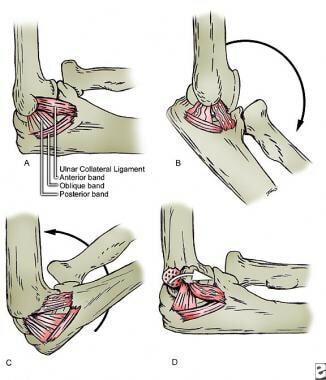 The lateral epicondyle is a prominent palpable process that projects laterally from the capitellum and is the point of origin of the common extensor tendon. The lateral supracondyle ridge is a bony ridge that runs proximally on the lateral humerus from the lateral epicondyle. The ulnar nerve, which runs in close proximity to the medial epicondyle, often may be palpated as a rounded cord just posterior to this bony prominence. The elbow joint is a hinge-type synovial joint formed where the distal end of the humerus articulates with the proximal ends of the radius and ulna. It is a uniaxial joint with movements of flexion and extension. Normal range of motion is from 0° (full extension) to 135° (full flexion). Most functions of the elbow require motion of 30-130°. Consequently, a 30° extension lag has little functional significance. The normal physiologic carrying angle of the elbow in the anatomic position (full supination and extension) is approximately 165-170° (10-15° of valgus angulation). Flexion is produced by the brachialis (the main flexor muscle) and the brachioradialis. In supination, the biceps brachii also flexes this joint; in pronation, the pronator teres assists in flexion. Flexion is limited by the apposition of the anterior surfaces of the forearm and arm, by tension of the posterior arm muscles, and by the collateral ligaments. Extension is produced by the triceps brachii and is assisted by gravity and the anconeus . Extension is limited by impingement of the olecranon of the ulna on the olecranon fossa of the humerus and by tension of the anterior muscles and collateral ligaments. Further complicating this pattern of development, the trochlear ossification center is frequently composed of multiple irregularly sized foci that eventually coalesce into a single structure. The trochlear and capitellar ossification centers eventually fuse. The pattern of ossification at these multiple sites is highly variable. In the developing elbow, fracture through the medial condyle involves part of the cartilaginous or partially ossified trochlea and the ossified medial epicondyle. With the insertion of the common flexor tendon of the forearm and the medial collateral ligament on the medial epicondyle, the fracture fragment tends to rotate around the axis of the epicondyle and can present at various degrees of rotation. Complete rotation puts the fracture surface facing the anterior and medial side of the elbow, with the medial epicondyle pulled distally and the articular surface facing posteriorly and laterally. In addition, the surrounding soft tissues can be torn, and there may be damage to the articular surface of the ulna. 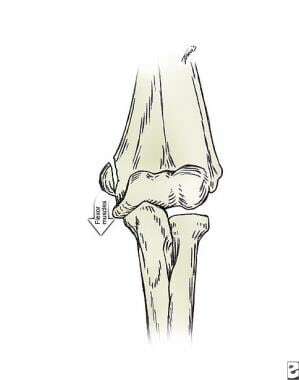 Damage to the articular capsule or medial collateral ligament of the elbow may be present. The ulnar nerve and the vasculature surrounding the elbow joint are also at risk. The blood supply to the epiphysis enters with the attachment of the medial collateral ligament and the common flexor tendon. Separation of these structures at the time of injury or at surgery may lead to avascular necrosis. The medial epicondyle fragment is usually displaced distally, though at least two cases of displacement of the fragment proximally have been reported. The fracture line usually involves only the apophysis; however, occasionally a fragment of metaphyseal bone is found attached to the avulsed fragment. If the fragment is incarcerated within the joint, the fragment may become adherent to the coronoid process of the ulna. When the fragment is incarcerated within the joint, the universal finding is a thick fascial band that binds the ulnar nerve to the underlying muscle. This thick fascial band is responsible for ulnar nerve dysfunction, either acutely or as a late finding. Other elbow fractures may be associated with medial epicondyle fractures, and care must be taken to recognize the full extent of the injury. Associated injuries include radial neck fractures, olecranon fractures, and coronoid process fractures. Valgus levering force creating fracture. Olecranon acting as a wedge and creating medial condyle fracture. Medial condyle fracture caused by traction through flexor pronator origin. Three mechanisms of injury for medial epicondyle fractures [20, 21] have been proposed for an acute injury. All of them result in a partial or complete separation of the apophyseal fragment from the rest of the humerus. The first mechanism of injury is a direct blow on the posterior medial aspect of the epicondyle that may be associated with fragmentation of the avulsed bone. 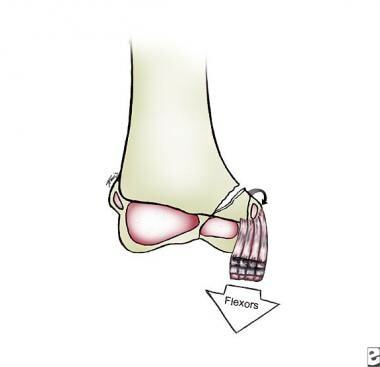 The second mechanism is a pure avulsion injury produced by the flexor muscles of the forearm (see the image below). This avulsion may occur in combination with a valgus stress that locks the elbow in extension. The classic example is the child that falls on the extended arm and hyperextends the wrist and fingers, placing more stress on the forearm flexors. The normal valgus angulation or carrying angle of the elbow tends to accentuate the forces responsible for the avulsion injury. This mechanism can also explain associated injuries, including a radial neck fracture with valgus angulation and greenstick fractures of the olecranon. Epicondyle fractures can be caused by traction forces. This second type of avulsion injury may be a pure muscular avulsion secondary to contraction of the forearm flexor musculature with an elbow flexed. This mechanism may be responsible for medial epicondyle fractures associated with arm wrestling and throwing a baseball. The third mechanism proposed for medial epicondyle fracture is associated with a dislocation of the elbow (see the image below). In this mechanism, the ulnar collateral ligament provides an avulsion force that causes the medial epicondyle to fail. Elbow dislocation associated with medial epicondyle fracture. In this lateral view, fragment is marked with circle. Fractures of the medial condyle are so rare that they receive little coverage in most popular textbooks and may not be mentioned at all in others. The incidence is described in the literature as being no higher than 1-2% of all elbow injuries in children. Most displaced medial condyle fractures occur when the trochlea is not ossified completely. Various studies have cited different average ages (ie, 10, 11, 9.5, and 7 years). Although a child of any age can sustain this fracture, it is most common during the developing years (ie, in children aged 7-14 years). Children younger than 5 years tend to have nondisplaced fractures and good results. Older children tend to have more severely displaced fractures that involve the partially developed trochlear ossification center. Good results are obtained in patients who are seen early after injury and who have adequate reduction and fixation of their fractures. In patients seen late, proper reduction and immobilization are necessary to achieve satisfactory results; however, this is usually more difficult to achieve. Preserving full range of motion of the elbow depends on restoring the snug relation between the humerus and the ulna throughout the arc of motion. Most children with medial epicondyle fractures treated either nonsurgically or surgically end up with good long-term functional results. Children with fracture displacement greater than 5 mm treated nonsurgically had results that were comparable to those of children who underwent surgical stabilization. Open reduction with internal fixation (ORIF) is required in children with medial epicondyle fractures and incarcerated fragments that block motion. Comminuted medial epicondyle fractures appear to do worse if the epicondyle is excised than if they are treated nonsurgically. Rockwood CA, Wilkins KE, Beaty JH. Apophyseal injuries of the distal humerus. Fractures in Children. 3rd ed. Philadelphia: Lippincott-Raven; 1996. 800-19. Behrman MJ, Shelton ML. Fracture of the medial condyle of the humerus in an elderly patient. J Orthop Trauma. 1990. 4(1):98-101. [Medline]. Bensahel H, Csukonyi Z, Badelon O. Fractures of the medial condyle of the humerus in children. J Pediatr Orthop. 1986 Jul-Aug. 6(4):430-3. [Medline]. Chacha PB. Fracture of the medical condyle of the humerus with rotational displacement. Report of two cases. J Bone Joint Surg Am. 1970 Oct. 52(7):1453-8. [Medline]. Fahey JJ, O'Brien ET. Fracture-separation of the medial humeral condyle in a child confused with fracture of the medial epicondyle. J Bone Joint Surg Am. 1971 Sep. 53(6):1102-4. [Medline]. Fowles JV, Kassab MT. Displaced fractures of the medial humeral condyle in children. J Bone Joint Surg Am. 1980 Oct. 62(7):1159-63. [Medline]. Ghawabi MH. Fracture of the medial condyle of the humerus. J Bone Joint Surg Am. 1975 Jul. 57(5):677-80. [Medline]. Mirsky EC, Karas EH, Weiner LS. Lateral condyle fractures in children: evaluation of classification and treatment. J Orthop Trauma. 1997 Feb-Mar. 11(2):117-20. [Medline]. Papavasiliou V, Nenopoulos S, Venturis T. Fractures of the medial condyle of the humerus in childhood. J Pediatr Orthop. 1987 Jul-Aug. 7(4):421-3. [Medline]. Varma BP, Srivastava TP. Fracture of the medial condyle of the humerus in children: a report of 4 cases including the late sequelae. Injury. 1972 Nov. 4(2):171-4. [Medline]. De Boeck H, De Smet P, Penders W. Supracondylar elbow fractures with impaction of the medial condyle in children. J Pediatr Orthop. 1995 Jul-Aug. 15(4):444-8. [Medline]. Leet AI, Young C, Hoffer MM. Medial condyle fractures of the humerus in children. J Pediatr Orthop. 2002 Jan-Feb. 22(1):2-7. [Medline]. Louahem DM, Bourelle S, Buscayret F, Mazeau P, Kelly P, Dimeglio A, et al. Displaced medial epicondyle fractures of the humerus: surgical treatment and results. A report of 139 cases. Arch Orthop Trauma Surg. 2010 May. 130(5):649-55. [Medline]. Pathy R, Dodwell ER. Medial epicondyle fractures in children. Curr Opin Pediatr. 2015 Feb. 27 (1):58-66. [Medline]. Patel NM, Ganley TJ. Medial epicondyle fractures of the humerus: how to evaluate and when to operate. J Pediatr Orthop. 2012 Jun. 32 Suppl 1:S10-3. [Medline]. McCarthy SM, Ogden JA. Radiology of postnatal skeletal development. V. Distal humerus. Skeletal Radiol. 1982 Jan. 7(4):239-49. [Medline]. Moore KL. Clinically Oriented Anatomy. 3rd ed. Philadelphia: Williams & Wilkins; 1992. Dellon AL, Ducic I, Dejesus RA. The innervation of the medial humeral epicondyle: implications for medial epicondylar pain. J Hand Surg Br. 2006 Jun. 31 (3):331-3. [Medline]. Oh CW, Park BC, Ihn JC. Fracture separation of the distal humeral epiphysis in children younger than three years old. J Pediatr Orthop. 2000 Mar-Apr. 20(2):173-6. [Medline]. Ip D, Tsang WL. Medial humeral epicondylar fracture in children and adolescents. J Orthop Surg (Hong Kong). 2007 Aug. 15(2):170-3. [Medline]. Ngom G, Fall I, Sy MH, Dieme C, Ndoye M. [Fractures of the medial humeral epicondyle in child: preliminary study about 18 cases]. Dakar Med. 2003. 48(3):199-201. [Medline]. Babal JC, Mehlman CT, Klein G. Nerve injuries associated with pediatric supracondylar humeral fractures: a meta-analysis. J Pediatr Orthop. 2010 Apr-May. 30(3):253-63. [Medline]. Landin LA, Danielsson LG. Elbow fractures in children. An epidemiological analysis of 589 cases. Acta Orthop Scand. 1986 Aug. 57(4):309-12. [Medline]. Saraf SK, Tuli SM. Concomitant medial condyle fracture of the humerus in a childhood posterolateral dislocation of the elbow. J Orthop Trauma. 1989. 3 (4):352-4. [Medline]. Shillington M, Collins B, Walsh HP. Medial humeral condyle fracture with an ipsilateral dislocated radial head. Ann R Coll Surg Engl. 2009 Mar. 91(2):W12-4. [Medline]. [Full Text]. Milch H. Fractures and fracture dislocations of the humeral condyles. J Trauma. 1964 Sep. 15:592-607. [Medline]. Kilfoyle RM. Fractures of the medial condyle and epicondyle of the elbow in children. Clin Orthop Relat Res. 1965 Jul-Aug. 41:43-50. [Medline]. Farsetti P, Potenza V, Caterini R. Long-term results of treatment of fractures of the medial humeral epicondyle in children. J Bone Joint Surg Am. 2001 Sep. 83-A(9):1299-305. [Medline]. Skaggs DL. Elbow Fractures in Children: Diagnosis and Management. J Am Acad Orthop Surg. 1997 Nov. 5 (6):303-312. [Medline]. Harrison RB, Keats TE, Frankel CJ, Anderson RL, Youngblood P. Radiographic clues to fractures of the unossified medial humeral condyle in young children. Skeletal Radiol. 1984. 11 (3):209-12. [Medline]. Yates C, Sullivan JA. Arthrographic diagnosis of elbow injuries in children. J Pediatr Orthop. 1987 Jan-Feb. 7(1):54-60. [Medline]. Pappas N, Lawrence JT, Donegan D, Ganley T, Flynn JM. Intraobserver and interobserver agreement in the measurement of displaced humeral medial epicondyle fractures in children. J Bone Joint Surg Am. 2010 Feb. 92(2):322-7. [Medline]. Edmonds EW. How displaced are "nondisplaced" fractures of the medial humeral epicondyle in children? Results of a three-dimensional computed tomography analysis. J Bone Joint Surg Am. 2010 Dec 1. 92(17):2785-91. [Medline]. Dodds SD, Flanagin BA, Bohl DD, DeLuca PA, Smith BG. 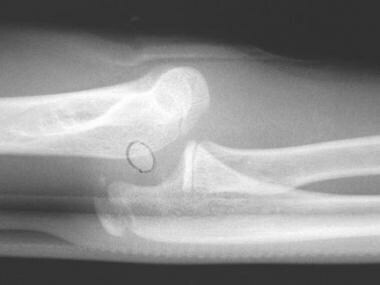 Incarcerated medial epicondyle fracture following pediatric elbow dislocation: 11 cases. J Hand Surg Am. 2014 Sep. 39 (9):1739-45. [Medline]. Tarallo L, Mugnai R, Fiacchi F, Adani R, Zambianchi F, Catani F. Pediatric medial epicondyle fractures with intra-articular elbow incarceration. J Orthop Traumatol. 2015 Jun. 16 (2):117-23. [Medline]. Karlsson MK, Herbertsson P, Nordqvist A, Besjakov J, Josefsson PO, Hasserius R. Comminuted fractures of the radial head. Acta Orthop. 2010 Apr. 81 (2):224-7. [Medline]. Haxhija EQ, Mayr JM, Grechenig W. [Treatment of medial epicondylar apophyseal avulsion injury in children]. Oper Orthop Traumatol. 2006 Jun. 18(2):120-34. [Medline]. Hoppenfeld S, Murthy VL. Treatment and Rehabilitation of Fractures. Philadelphia: Lippincott Williams & Wilkins; 2000. Schematic of two types of medial condyle fractures, as described by Milch. Displacement patterns as described by Kilfoyle. Positioning for valgus stress radiograph. Anteroposterior view of displaced medial epicondyle fracture. Anteroposterior view of displaced medial epicondyle fracture after reduction. Elbow dislocation associated with medial epicondyle fracture. Lateral view after reduction. Reduced fragment is marked. Note normal location somewhat posteriorly on distal humerus. Elbow dislocation associated with medial epicondyle fracture. Anteroposterior view after fixation.